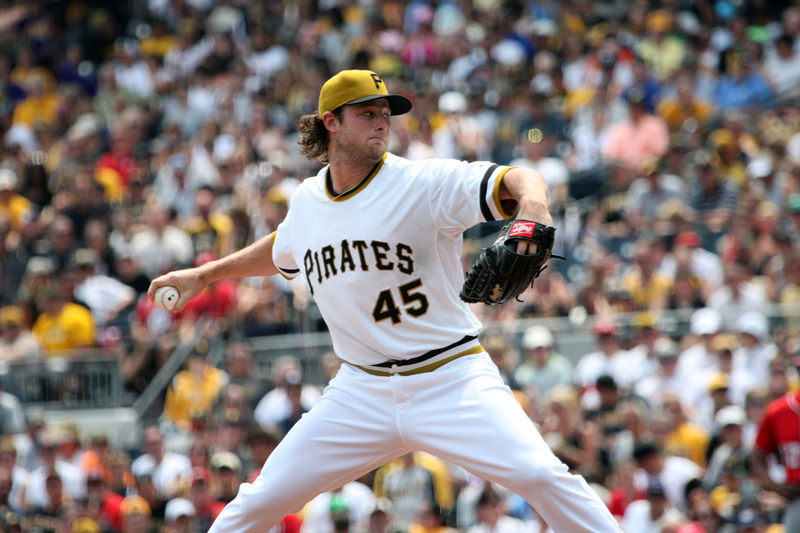 Gerrit Cole wasn’t crazy about the idea of getting extra rest. After all, few athletes are more creatures of habit than starting pitchers. However, the right-hander admitted after he pitched into the seventh inning and the Pirates beat the Chicago Cubs 5-4 in the first game of Tuesday’s day-night doubleheader that some time off helped. The Pirates lost the second game 2-1 and remained in control of the National League wild card race with the split of the twinbill, leading the Cubs by two games. Cole did not get the decision and his line was not dominant as he allowed four runs — three earned — and six hits in 6 1/3 innings with eight strikeouts and no walks while failing to notch his 17th win. However, Cole did not get a lot of cooperation from his teammates. Catcher Chris Stewart’s throwing error allowed the Cubs to score a run in the first inning. The Cubs had a three-run seventh off Cole to pull into a 4-4 tie, but two of the runs scored on wild pitches by reliever Joakim Soria. Cole had eight days off — rather than the normal four — since pitching seven scoreless innings on Sept. 6 to beat the Cardinals at St. Louis. The move was made to give the 25-year-old a break and line him up to start either the wild card game Oct. 7 or the first game of a National League Division Series on Oct. 9 if the Pirates win the division. Cole said he felt fine physically but was disappointed in his finish. “I felt fresh,” Cole said. “I had some good weapons today. I thought the stuff was pretty crisp. Just a lack of execution in key situations that could have kept the pitch count down and gotten us out of the seventh inning. “I needed to put some guys away better. i had some opportunities for more strikeouts … as you get late in the game, late in the season, that’s how rallies start, with ground balls. We’ve got to get better. We’ve got to execute late in the count better. Manager Clint Hurdle knew it was a bit of a calculated risk to take Cole off his normal schedule but was happy with the way it played out. “He prepared a little differently,” Hurdle said. “It was a couple of side work opportunities, one very light and one with a little more intensity. Maintained focus and composure. –The Pirates were stymied in the second game by Cubs left-hander Jon Lester, who pitched a five-hitter for his first complete game of the season and 12th of his 10-year career. The Cubs signed Lester to a six-year, $155-million contract as a free agent in December just for games like this. Lester struck out nine and walked only one in a 111-pitch effort. –Left-hander J.A. Happ’s five-start winning streak ended as he gave up two runs and eight hits in 5 2/3 innings with eight strikeouts and two walks. The Cubs built a 2-0 lead against Happ on Anthony Rizzo’s RBI single in the first inning and Dexter Fowler’s RBI double in the fifth. –Left fielder Starling Marte did not start for a third straight game in the opener after having the stomach flu but entered as a defensive replacement in the seventh inning then hit the game-winning sacrifice fly in the eighth as the Pirates beat Chicago 5-4. Marte started the second game and went 1-for-4 with two strikeouts and a caught stealing. –Right-hander Vance Worley had his contract purchased from Class AAA Indianapolis. Worley will work out of the bullpen after going 3-1 with a 2.38 ERA in five starts with Indianapolis. He began the season with the Pirates and went 4-5 with a 3.78 ERA in 20 games, including eight starts, before being designated for assignment. He did not pitch Tuesday. Right-hander Radhames Liz was designated for assignment to clear a spot on the 40-man roster for Worley. Liz made 14 relief appearances in two stints with Pirates and was 1-4 with a 4.24 ERA. He gave up four runs in six innings in three games after being called up Sept. 1 from Indianapolis. –The Pirates named Class AA Altoona second baseman Max Moroff and low Class A West Virginia (Charleston) right-hander Yeudy Garcia as the organization’s Minor League Player and Pitcher of the Year. Moroff hit .293 with seven home runs, 51 RBIs and 16 stolen bases while leading the Eastern League with 79 runs scored and 136 games played. Garcia was the South Atlantic League Pitcher of the Year as he went 12-5 with one save and a 2.10 ERA in 30 games, including 21 starts.